Check out the latest Limited Edition Boxes on My Subscription Addiction! 5th Avenue Style Limited Edition Summer Time Box Handbag Spoiler #2 + Coupons! 5th Avenue Style Limited Edition Summer Time Box Watch Spoiler + Coupons! 5th Avenue Style Limited Edition Summer Time Box Handbag Spoiler + Coupons! Birchbox Limited Edition Vogue: Transformation Box – Available Now! 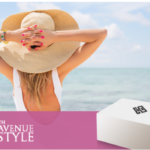 5th Avenue Style Limited Edition Summer Time Box Available Now + Coupons! BeautyFIX Limited Edition Bridesmaid Spring 2018 Box – Available Now! 5th Avenue Style Limited Edition Spring Time Box Jewelry Spoiler #2 + Coupons! 5th Avenue Style Limited Edition Spring Time Box Handbag Spoiler #3 + Coupons! 5th Avenue Style Limited Edition Spring Time Box Handbag Spoiler #2 + Coupons!